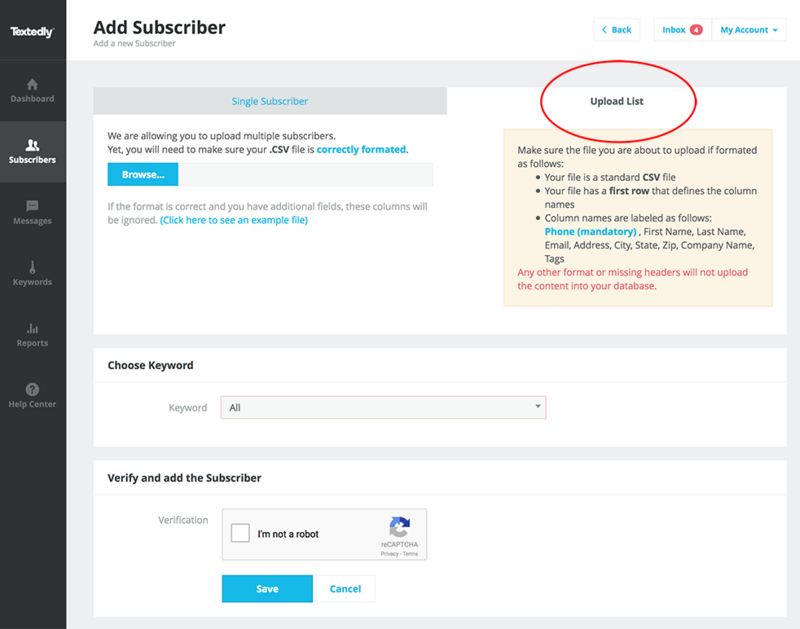 How to upload your existing Subscriber's list to Textedly. Here are the instructions to import your list of mobile Subscribers. Click on the Subscribers tab on the left side navigation bar. Next you will see a blue button in the top right corner that says + New Subscriber. If you are new to Textedly, when you click on Upload List it will ask you to request and enable the Upload feature. Send us your request and Textedly will review. If you are approved, you will see this feature enabled on your account within a few hours. Keep in mind that if you signed up to Textedly with a free email account like Gmail, Yahoo, AOL, etc... we rarely approve you having the Upload feature enabled on your account. Consider signing up to Textedly with your verified Business Email address. Once your request to Upload is approved, you will now see that feature available to you in your account. Please note that you must first create at least one Keyword inside your Textedly account before you can Upload your list. Your list can only be in a .CSV file format in order to Upload. In row one of your .CSV file, the only allowable headers are Phone, First Name, Last Name, Email, Address, City, State, Zip, Company Name, Tags. They need to be spelled exactly like we have it in the example below. The Upload feature is not available on the Free 14 day trail. You will need to be on one of the paid subscription plans to request this feature.